Can you believe it? We’re almost to the holiday season – a time for friends and family to gather around the table for warm meals, big laughs and good company. It’s been a long year and there’s a lot to celebrate and be thankful for. Celebrate our open spaces by bringing the outdoors in this holiday season. There are so many wonderful things to decorate your holiday table that you can find right in your own backyard. 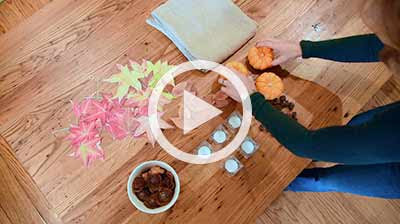 For inspiration, we put together an instructional video on creating a beautiful holiday table setting from materials found right outside your backdoor. We have more good news. At the end of October, we protected another 63 acres mid-Coyote Valley. This was our second land acquisition in the Valley in the last six months and another huge win for local wildlife. The property lies within the Fisher Creek floodplain and is another critical piece of this landscape connecting the Santa Cruz Mountains with the Diablo Range. And we’re not done yet. There’s a lot more work to do to protect this critical wildlife linkage. Oaks of Silicon Valley, Teddy Miller 2016; Wallace Stegner Lecture Series, POST 2017; Kayaker at Bair Island, Jordan Plotsky 2017.